Behind The Thrills | Pee Wee Herman is back, and he’s going on Holiday in a new trailer! Pee Wee Herman is back, and he’s going on Holiday in a new trailer! 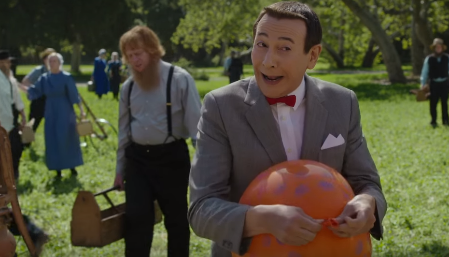 Pee Wee Herman is back, and he’s going on Holiday in a new trailer! Pee Wee Herman was the ultimate 80’s kid. He had an amazing house, the coolest bike, and he went on one really big adventure. Of course, he also went under the big top…but no one is holding that against him. Pee Wee Herman was a fixture in many houses, with both his movies and his kids show Pee Wee’s Playhouse. Now, he’s back in an all new movie that looks to be putting him back to his big adventures. The new movie will premiere exclusively on Netflix in March, and will star Paul Ruebens as the titular Pee-Wee. Pee Wee is content with simple, small town life, until he meets a mysterious drifter who kick starts him on a Holiday. The adventure takes him to different parts of the country on a road trip that is distinctly Pee Wee. The new film is the character’s first return to film since 1988’s Big Top Pee Wee. What do you think of the new film? Are you excited to see Pee Wee finally return?